Ticia Lea has dedicated the last sixteen years of her life to making others feel good. 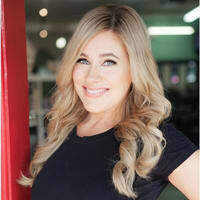 She graduated from the Integrative Healing Arts Academy in Los Angeles, CA in 2001 which lead to her attending the Newberry School of Beauty in 2003 to obtain her Esthetician’s license. With a deep desire to incorporate both her passion for the therapeutic healing arts and her enthusiasm for natural beauty into her services, the next evolutionary step for Ticia was to become a certified makeup artist. For the past three years, she’s specialized in eyelash extensions, and has been an Eyelash Extension Trainer and Lash Mentor for the last year and a half. Before that, Ticia worked all over the West Coast in her thirteen years as a Licensed Aesthetician, Massage Therapist, Certified Natural Makeup Artist, and Herbal Nutrition Practitioner. After a summer spent demonstrating the benefits of organic skincare lines in Colorado in 2012, Ticia returned to California and performs a wide range of services including several different types of modalities such as organic skincare, waxing, brow shaping and eyelash extensions. Ticia is a triple certified Lash Specialist, Certified Lash Master and Eyelash Extension Trainer, and a member of the National Eyelash Education and Safety Association. Those qualifications have made her a highly sought-after Esthetician, landing more than a few high-profile clients looking for red-carpet-ready lashes and glowing skin!